The piney pungency of rosemary is a terrific counterpoint to foods that I often find too rich or too sweet. Combined with garlic and salt, and other woody herbs like thyme and savory, rosemary perks up a medley of rich roasted root vegetables, or just potatoes, or sparks a salt and garlic mash for marinating meat. To counterbalance sugar, I add rosemary to orange and lemon marmalade and herb jelly. I made a great rosemary and mint jelly for last year’s Tigress Can Jam and my Meyer lemon marmalade with rosemary is one of the most frequented recipes on my blog. Mother’s Kitchen started the Spice Rack Challenge right after the New Year when I’m already thinking about all of the things I didn’t accomplish over the holidays, while also using up the bounteous produce – namely a bushel of Florida citrus – that arrived as a gift. During these dark days and deep freezes, we’re craving salads and raw vegetables so I could see putting rosemary to good use. Over the holidays, I gave away over a hundred jars of produce that I’d canned throughout last year, including several “portable pantries” that should last the winter in their new households. One thing that I didn’t get to was baking crackers to go with that special spicy chili jelly and local brie. For the Spice Rack Challenge, I decided to add rosemary to a lightened up version of Mark Bittman’s cream crackers (the ones that he playfully cracked over his head in an early 2009 video that accompanies his New York Times website). Those crackers are addictive. While I was at it, I experimented with a no-dairy version using olive oil and water instead of butter and milk. 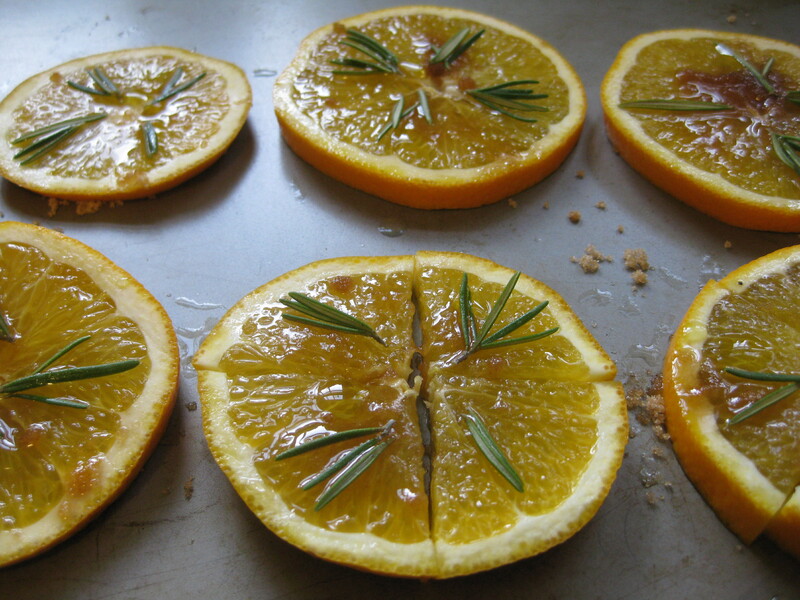 Lately, I have also been experimenting with roasting oranges, which I think are terrific with rosemary. A couple of weeks ago, I combined roasted oranges and beets with pasta. 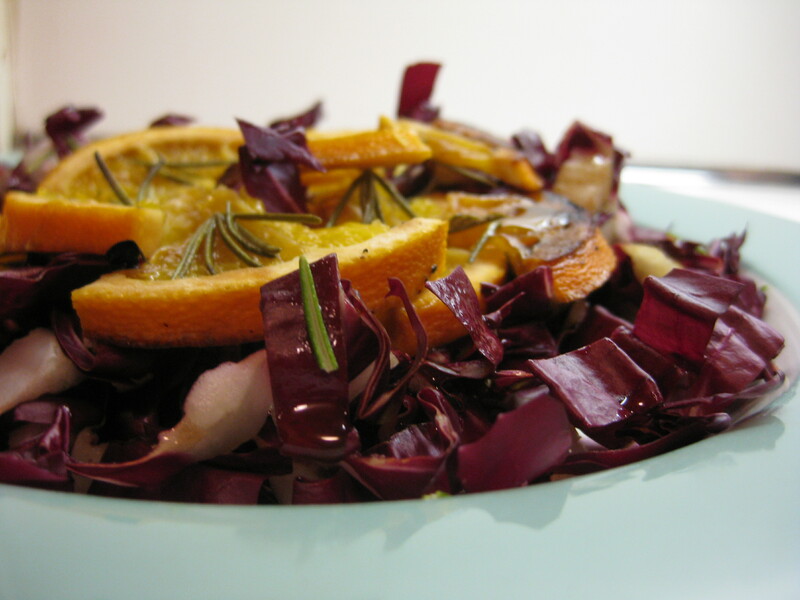 This time, I roasted the oranges with rosemary and combined them with a salad of treviso (an elongated version of radicchio) that I harvested at our CSA. 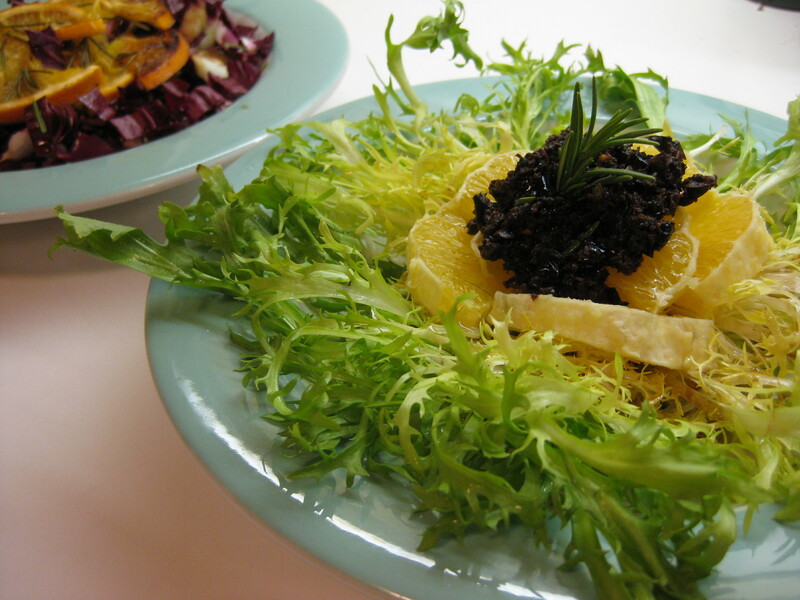 A second salad, with fresh oranges peeled and sliced crosswise in quarters topping a bed of slightly bitter frisee, was accompanied by a black olive tapenade, another inspiration from Mark Bittman (also with a video). 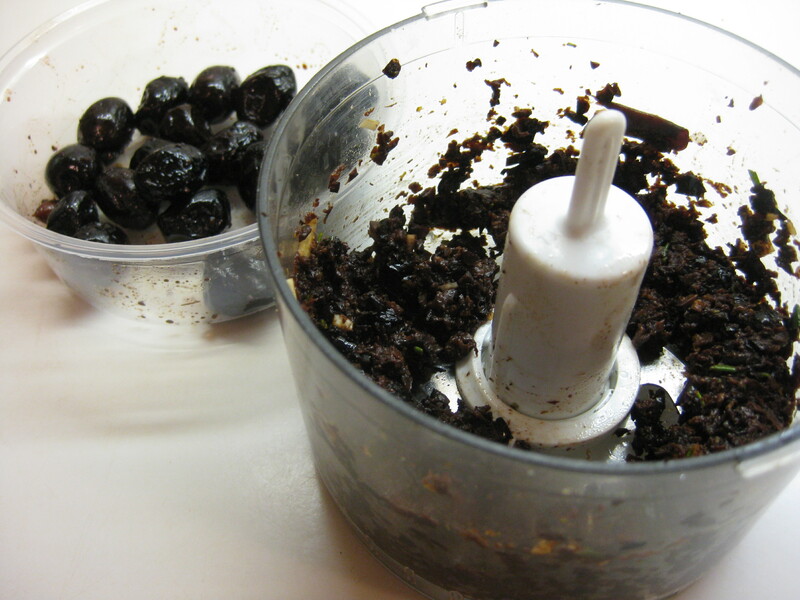 I didn’t look up how he did it, but I combined oil-cured black olives with rosemary, garlic and grated orange rind. The salad dressing included olive oil, a little Balsamic vinegar, fresh orange juice, shallot, garlic and… you guessed it… chopped rosemary. The salads, separately or side by side, were an explosion of flavor, and the rich little biscuits were great companions. I grow herbs in pots at my house since I live in town and parse out my tiny ground for other crops. 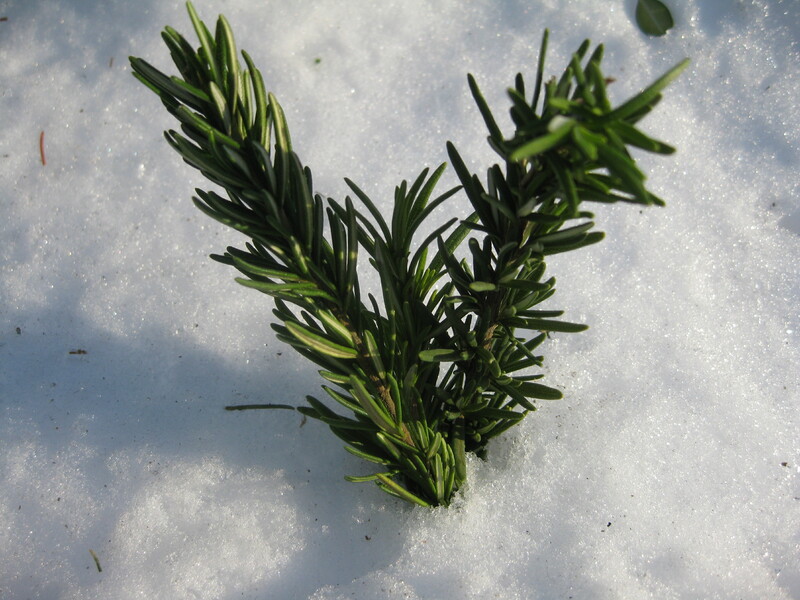 Rosemary rarely overwinters. A local NPR garden show from Philadelphia that airs on Saturday complains about the fact that rosemary acts like it will make it until sometime in January, when it gives up the ghost. I can pluck the dried out leaves from the plant, since they’re still potent, but I typically harvest the whole thing and stick the branches in little bags in the freezer. I haven’t been impressed with the results of air-drying since I find the oiliness of the fresh (or even frozen) leaves to be part of the appeal. I did experiment with drying them in salt, which preserves the flavor very well but like air-drying dries them out more than I prefer. Of course, the logical solution is to bring the pot indoors during the winter, but my plants typically develop spider mites. I’d love to hear how others keep their rosemary going year-round. Preheat the oven to 400 degrees. Line a baking pan with parchment paper (or use a Silpat). Put the flour, cheese, salt, rosemary and butter in the bowl of a food processor and pulse to cut into small pieces. With the motor running, quickly add the milk or cream in tablespoon batches. Add additional milk or cream to make dough that holds together. If you add too much liquid, simply add more flour to balance. Remove the dough from the food processor and knead it lightly into a ball, flattening it into a disk. Roll the dough on the parchment paper or Silpat, flouring it as necessary, creating as close to a rectangle as possible approximately 1/8 inch thick. Score the dough lightly (not penetrating the entire surface) into rectangles or other shapes. Sprinkle with sea salt. Bake for 10-12 minutes or until lightly brown. Remove to a rack to cool. Break into pieces and store in airtight containers. 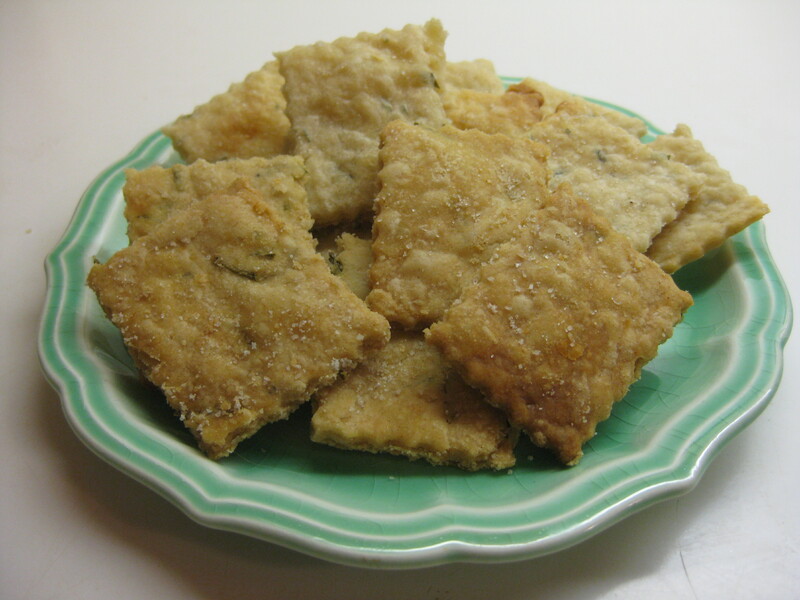 Variation: Olive Oil Crackers. 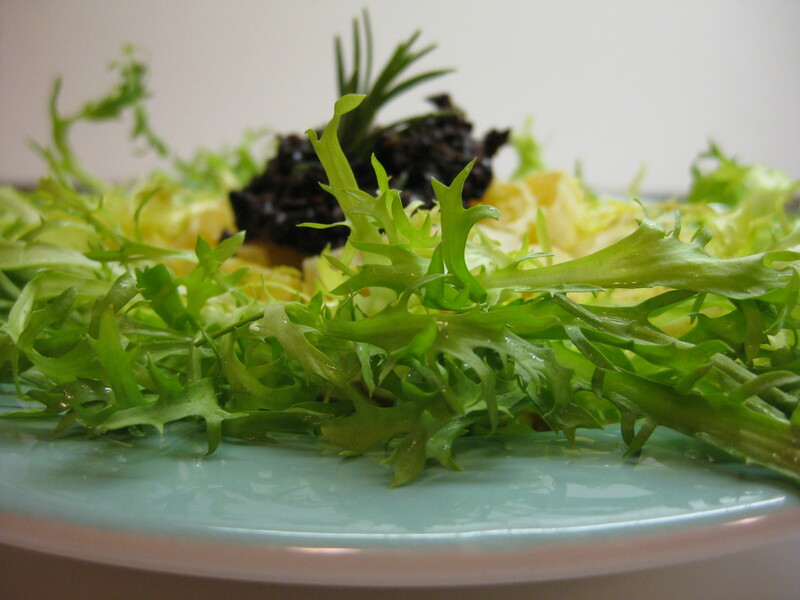 Substitute ¼ c olive oil for the butter and up to ¼ c water for the milk or cream. Omit the cheese. Preheat the oven to 400 degrees. Slice the oranges, unpeeled, in very thin slices (1/8 inch or 3/16). Place the slices – whole or quartered — on a non-reactive baking sheet (if using aluminum, put down parchment paper.) Sprinkle with sugar, place rosemary on top and sprinkle with olive oil. Bake for 10 minutes. The bottom will carmelize. (You could put the rosemary on the bottom, but be sure it doesn’t stick to the pan.) Remove to a rack to cool. Chop up for use in salads and other dishes. Store in an airtight container. Whiz the ingredients in a small food processor. Shake all ingredients together, taste and adjust seasonings or ingredients. Your crackers look fantastic! A goal of mine (well, a carry over goal from last year…) for this year is to start making our crackers. I’ll try these! 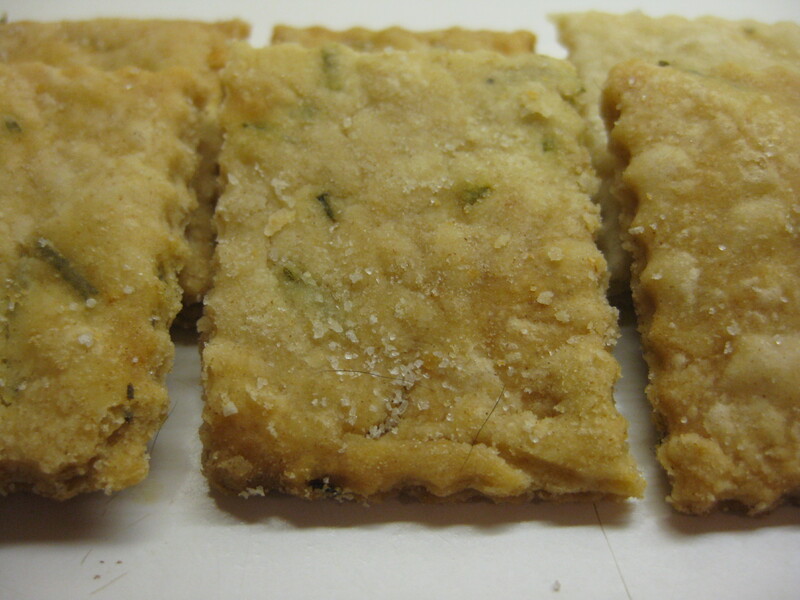 Crackers are a carryover for me as well – these just might inspire me to get off my duff! This all looks delicious, but those crackers stand out a mile. I’ll be trying these soon. agreed with all of the above. those crackers are calling my name! I am enjoying this site immensley…I just found it and it is my day off! Thanks so much. I’m having a good time with it. I bought a beautiful Rosemary plant last year and when I heard it most likely would not survive the winter outdoors (Chicago area) I potted it and brought it indoors when frost threatened. It thrived indoors all winter. The wonderful fragrance in my kitchen was a bonus! In spring it went back in the ground and is growing beautifully. It’s almost time to repot for winter and I look forward to another winter with my house guest!